Barbara Meek talks about the history of cut glass, the patterns, and the major turn-of-the-century manufacturers. Barbara is the president of the Florida (Sunburst) chapter of the American Cut Glass Association, which is a member of our Hall of Fame. I started collecting cut glass when I was about 18. My sisters were married, and during the summer, I would go out and stay with them in the Midwest and work. That was back in the late ’70s when you could go to flea markets and you could find wonderful things. Every weekend I would go antiquing with both my sisters, and at the end of the summer, after working, I had some extra money. I decided I was going to buy myself a piece of cut glass. 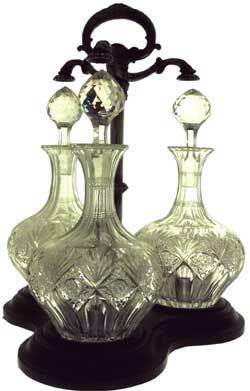 The finest cut glass was made by American companies, and the height was from the 1890s to about 1908 or so. At that point the format started to change a little bit; it wasn’t the Brilliant cut glass. Initially, I was really attracted to the Brilliant cut glass because it is so thick and the cutting is deep, it reflects the light. I liked the way it sparkled. I’ve been collecting off and on, depending on my personal situation. When you’re raising a family or have kids in college, you don’t collect so much. There were times when I didn’t acquire very much, and there was a point where I became concerned about fake glass. They don’t really know where it came from, but it started to materialize in the mid- to late 1980s. That’s the reason we do the black light testing and other things. It’s very hard now to walk into an antique shop and find cut glass like you used to be able to in the ’70s and early ’80s. The advantage of being a member of any collectors’ association is you can find the items you’re interested in collecting. I’m really expanding my collection a great deal because of being a member of the Cut Glass Association. Collectors Weekly: How did it get the name “Brilliant” cut glass? Meek: I believe it was actually coined by an early writer on cut glass named Dorothy Daniel. We collect the heavy cut glass, the heavy Brilliant, which has the high grade silica in it. There are also glass clubs that collect some of the early glass, like flint glass, but with the improved formulas of the Brilliant Period, you could get the heavier cuts that weren’t possible with flint glass. Christian Dorflinger of the Dorflinger Glass Company in White Mills, Pennsylvania coined the title “rich cut glass,” and that’s what’s referred to during the period that we call American Brilliant. Starting in about 1872 or so, the Brilliant period went until the Flower period began, which was about 1905. The early period is mostly flint glass. The patterns are really not distinguished between American cutting houses and European cutting houses, so it’s hard to tell whether you have a European piece during that time or American. In fact, I’ve read that the companies actually sent the glass overseas and back in order to be able to advertise it as being imported. Most of the purchasers thought that they had to be European to be good. This changed in the 1870s and 1880s when Hawkes [see pitcher above] started winning awards at the Paris expos. That’s when American glass manufacturers got to be recognized. Libbey Glass had a whole pavilion at the Chicago World’s Fair in 1893, and that’s really what made people truly aware of it. But when I give my lectures around town to women’s groups, I say that I think that the American Brilliant period started earlier, because Mary Todd Lincoln ordered cut glass for the White House. Collectors Weekly: Who were some of the big cut glass manufacturers? Meek: There were a thousand companies in 1900 that cut the glass – not that made the glass to be cut, but that actually cut the product. They were scattered around all across the country. But you only had a handful of companies that actually produced the blank. Blanks were produced and cut by Libbey Glass Company. A lot of people recognized that name because after 1895, Libbey and Hawkes said they were going to sign their pieces. They’re still in business, but they’re not producing fine cut glass anymore, it’s more generic. You had Corning Glass Works, which produced blanks for many of the cutting shops in Corning, NY, including T. G. Hawkes and Company, which didn’t go out of business until the 1960s, and J. Hoare and Company. Hawkes founded the Steuben Glass Company to produce glass blanks for them in 1903, but subsequently sold it to the Corning Glass Works in 1918. Hawkes continued cutting until 1962 as an independent cutting shop. Steuben has been operated as a subsidiary of Corning Glass Works until the present. H.C. Fry and company produced blanks, and some of the people like Strauss bought their blanks from Europe as opposed to using American blanks. I don’t believe J. Hoare and Company ever produced their own glass. Dorflinger had both a cutting shop as well as the blank producing shop. They would produce glass, and sell some blank pieces to other cutting companies and keep some for their own cutting shops. They did the glass for the White House from President Lincoln until 1921, when they went out of business. To produce the blank, they had to heat the molten material, which is the sand and the potash and the lead. They had a crew of people: one person would actually gather it, put it on a blowpipe, and then hand it to the chair of the whole group, who would start to blow in it. Then he’d pass it to other people who would bring little bits of glass. It was a little gang of people with young boys, 14 years old or so, doing the apprentice work. Once companies got the blank glass, they would have a gang of cutters, from a rougher, who would make the initial cuts, to another individual, who would make the finer cuts, and then to a polisher. As early as the turn of the century, it was discovered that having a group of men – as opposed to one man who had to change his cutting wheels constantly – was an economical way of producing a piece of cut glass. The interesting thing about these cut glass industries is that they worked together. Even though cutters were paid more in the U.S. than the country they immigrated from (most of these cutters emigrated from France, like Christian Dorflinger, or Ireland and Germany) they did have grievances. Mostly pertaining to work conditions. The belt that propelled the cutting wheel had a strap that went up to the ceiling, and sometimes those would break. Glass also would break and fly, so the injuries in the cut glass industry were severe. They did not have any insurance like we do today when you work, so they had to band together. If a person was injured or if death occurred, they would reimburse the family or the worker. The cutters also wanted to limit the number of apprentices to one per cutting gang as opposed to two or more. It took 7 to 12 years to become a cutter, and they wanted to limit that so it wasn’t quite so long before you could get your Journeyman’s license. So they did have slowdowns at these companies, particularly in the 1890s, and if a company was having a slowdown, another cutting company would actually produce the glass for them. If Hawkes was having a slowdown, they would ask Dorflinger to cut them some glass to fill their orders. It’s a little different than what we would think of today. Collectors Weekly: Were there different patterns in cut glass? Meek: Yes. Like today, when you get married, you go to the store and you pick out your china pattern and your silver pattern. The same was true for your cut glass pattern. Each company had a series of patterns. Many of the contemporary writers around the turn of the century would advise the young gals to pick out more of a generic pattern of cut glass, a glass that you can mix and match, because glass was often broken and was very expensive. That’s why it was called rich cut glass. It was rich in that it was expensive to produce, expensive to buy, and it looked very lovely. Cut glass became popular because it reflected the light on the table. At that time, they were using candles and oil lamps and later gaslights, so they needed the glass to send light across the dining table. It reflected the colors of the flowers and the lights from the candles and shimmered it across the table. There were a lot of patterns made when Halley’s Comet was coming by. They picked a lot of color pattern names for that. The Russian pattern was called that because the Russian ambassador chose it for his table service. I consider it a generic pattern, because if it got a little nick on it, no one would ever be able to see it on your dining room table. It was a staple pattern that continued for many years. I can’t begin to tell you how many pattern names there are; probably in the thousands. Patterns were patented, and we get a lot of the information today from the patent records. Many patterns were quite similar, just different enough to be able to patent. A pattern is made up of a series of motifs. There are so many different motifs: Hobstar, strawberry diamond, punty cut, which is a very plain, round cut that’s plain in the center. These are combined to form a pattern. Some people collect by pattern. My hope chest had green cameo Depression glass, and that’s the only pattern of Depression glass that I have in my collection, nor do I want any other Depression glass patterns. There are collectors that will say, “I only want Libbey Sultana.” Some people only collect Strauss Imperial. Other people will collect only rare patterns. I tend to not be a pattern person when it comes to collecting cut glass, but there are people that will want the very rare patterns or very expensive patterns, like Aztec. Then there are panel patterns and something called a trellis pattern that people talk about a lot. Aztec was cut by Libbey and Panel was cut by Hawkes. They were quite expensive when they were made, and are therefore rare today, which makes people want to collect them. My personal collection tends to be more shapes. I’m intrigued by the fact that they made a toupee stand in cut glass besides baskets and other things. I go after the more unusual items. Collectors Weekly: What types of objects did they make out of cut glass? Meek: For the table, anything that could be served cold or room temperature. Heat destroys a piece of cut glass. So does changes in temperatures. They couldn’t just throw a piece of ice cream on a tray; they had to gradually bring the temperature of that tray, and they could not all of a sudden take that ice cream tray and throw it in some hot dishwater because it would pop or break or crack. But they made anything – desk items, dressing table items, table items. They had casserole dishes with a cover on top. They had caviar dishes. They had cake plates. They had fingerbowls. Cut glass was an appropriate gift to give to a bride. Every table wanted to have cut glass. You were socially correct if your table weighed a ton and cost a million. When you got married, you had to have a punchbowl set and your glassware, your tumblers or your goblets, decanter sets, ice bowls that often had a plate underneath so that the table could be protected from the condensation of the ice, sugar and creamers, and all the bonbon dishes. They made some utensils in cut glass where the handle was cut glass and the utensil part was sterling or silver plated. Collectors Weekly: Did all cut glass objects come in sets? Meek: Certainly your decanters with the goblets and the tumblers to match came in sets. Your candlesticks usually came in sets of two or four. With your berry bowls, you’d have a big bowl, and then you’d usually have six smaller bowls. For some reason it seemed like sets like this were usually in groups of six. 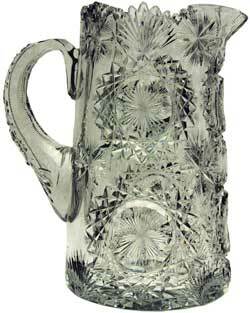 Pitchers with the tumblers to match were usually sets of six tumblers with the pitcher. Your number of guests at a dinner table should be somewhere between three and 12. Collectors Weekly: When did the use of cut glass fall out of fashion? Meek: Cut glass became unpopular during World War I, as it was considered unpatriotic to have frivolous things like cut glass. Most of the manufacturers, with the exception of Corning Glass Works, could not get the raw materials. Dorflinger got sand from France and potash from Germany, so they weren’t getting their product. Corning Glass Works could get raw materials because they had a contract to service the federal government with generic tumblers and glass products. So they were able to get the glass. So in 1900, you had lots of cut glass companies, but World War I took a huge chunk out of these companies and then Prohibition closed them up. By 1921, Dorflinger had to close down because people no longer could use their decanters and liquor glasses, and that was really the industry’s bread and butter. You never had cocktails before dinner during the Victorian era. After dinner, the men would stay at the table and have their whiskey or cognac while the ladies would go back into the parlor or their libraries and have coffee so that the men could have men’s talk. That started to change after the 1900s. About 1905, some very avant-garde society ladies would offer what we call cocktail before dinner. Tastes changed, and the manufacturers adapted. The heavier glass that was produced prior to 1900, the American Brilliant period, became less fashionable after the turn of the century in the Edwardian period, and the manufacturers started to produce lighter, thinner glass. These are the engraved pieces with the flower and nature motifs. They didn’t stop using lead, they just were able to make it more delicate. The ladies whose mothers had the real thick, heavy cumbersome glass wanted it lighter and more engraved. It took four years longer to learn how to engrave than it did to be a cutter. With Prohibition in 1921, glass got packed away into people’s cellars or attics, and it wasn’t until about 1950 that people started to bring it out and sell it. By the ’70s, you had even more of an influx, and that’s why a lot of people consider the ’70s the heyday of being able to find wonderful items at these flea markets and antique stores and garage sales. That’s when the Cut Glass Association was formed, about 1978, with a handful of collectors. Now we have several thousand members. Collectors Weekly: Is colored cut glass uncommon? Meek: I have no colored cut glass in my collection. Right now a lot of people are collecting colored cut to clear. There were companies in America that did cut colored glass, and from my readings of these hundred-year-old ladies’ magazines, Good Housekeeping, Ladies’ Home Journal, Harper’s Bazaar, and some others, colored glass was not thought of very highly for the dining table. It was fine to have as accent pieces in the home, but as far as on the dining room table, it was not something these writers were telling the new middle class to do. After the Civil War, people became wealthy. They were entrepreneurs. They were professional businessmen. They had moved to the city, and they acquired some money. Women’s entertainment styles had to emulate the positions that their husbands had acquired in the business world. To do this, they read all these etiquette cookbooks that actually went through how to set the table. These ladies’ magazines and these columns would tell them what they should wear to coordinate with the table. These writers felt that colored glass was garish and would conflict with any type of dining ambiance that they wanted to create, with the exception of the fingerbowl. They felt that fingerbowls would be very appropriate to have in color because it would camouflage the particles that would be left in the bowl, which I find quite humorous. They also thought that a colored hock wine glass was attractive on the table, but those are really the only two items they felt should be of colored cut glass. Collectors Weekly: You said it’s getting harder and harder to find cut glass? Meek: Old cut glass, yes. But I there has been more and more glass made in Czechoslovakia. The early cut glass that we collect, it’s very hard to find. A lot of it is being circulated among collectors, although there are still people who have a prized piece that has been in their family since the 1900s, handed down. Those pieces often have been used, so they’re going to have a lot of chips and may even be broken. Collectors Weekly: What is the difference between wood-polished glass and acid-polished glass? Meek: Wood polishing with stone or wood was a time-consuming and expensive process. A piece of glass that’s acid-polished was literally dumped into an acid bath and polished instantly. Cut glass at the time was expensive, but you could find inexpensive pieces that maybe were not as detailed or had some inclusions when the piece was being formed – a grain of sand or other material remained in the glass or whatever. You had it at all price levels, and that’s where you get into your different patterns. Some patterns took more work to produce and better quality glass than other inferior, lesser quality glass, simpler cuts or whatever. Collectors Weekly: What sets cut glass apart from other types of glass, like Depression glass, for example? Meek: Depression glass doesn’t have lead in it. 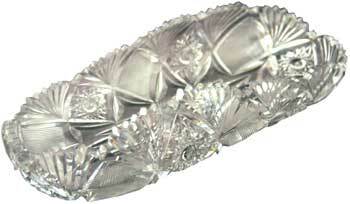 Depression glass tended to be pressed glass that was done in a mold and pressed by machine. What makes the difference is the composition of the raw materials, the formula. Depression glass pieces also tend to weigh quite a bit less than cut glass. Collectors Weekly: Are there any books you could suggest for people interested in cut glass? Meek: The Cut Glass Association has reproduced a series of the cutting house catalogs with the help of the Rakow Library at the Corning Museum. If you have a piece and you think it’s from a certain cutting house, you can go to those catalogs, which the ACGA sells, and actually identify the pattern. So that’s a very good source, and they have other good books listed on their website. Jane Spillman has written several books on cut glass. 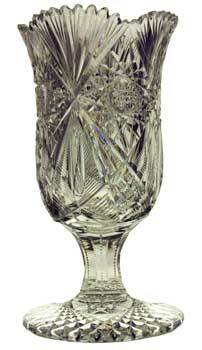 As far as the history of the time frame that cut glass was made, I like American Cut and Engraved Glass by Swan. Also, there’s Bill and Louise Boggess, who did a book called Identifying American Brilliant Cut Glass. That is one of the Schiffer books. Collectors Weekly: Any other advice on collecting cut glass? Meek: I think if they’re really interested in collecting, they should join the association. That’s the first thing they need to do. If they have a piece they’ve gotten from their grandmother or their mother – in this case, I’m sure it’s now grandmother – they need to respect it. It’s not being done today, not in that quality, and by respecting it, I mean they have to be very careful that it does not get exposed to changes of temperature, because it will break. You cannot take it from direct sunlight in your window and have your air conditioner blowing on it because it’s going to be hot on one side and cold on the other. It’s going to pop the glass. The other thing I would suggest is to not keep liquid in it. The Surgeon General said a few years ago that lead will seep out of the glass and so it’s not healthy to drink from cut glass. So don’t leave liquid in that decanter because the Surgeon General says it’s not healthy. I visually enjoy my glass, so I leave it out for visual enjoyment. If I want to have the flowers in it, I will use a silk flower as opposed to natural flowers, because I don’t have to worry about the water. Hi, I have been a member of ACGA since it was formed and I advertised in the first issue of the Hobstar. I have just finished reading your article and I think you did an outstanding job in providing information. I thought I had read everything published on cut glass but I found a lot of helpful information in your article. I agree and relate to all of the material. I know in the l970s I went to a lot of flee market and sales and found numerous article that today are considered rare. I remember one antique wholesale store that had a sale only for dealers on the lst of each month. At his sale I found a 7″ Hawkes panel plate and a LIbbey Columbia water pitcher and the prices were very reasonable. Needless to say there are not buys like that nowadays. I have a beautiful cut glass punch bowl with a stand that I would like to sell, but I’m not sure what I have or the pattern. How do I find out the pattern, who made it, and how much it is worth? It belonged to my great who died in 1988 at the age of 99. She had some wonderful things and many pieces of cut glass. Contact the American Cut Glass Association at http://www.cutglass.org The ACGA secretary may be able to locate a member, within driving distance, who would help you identify the company and pattern. There are many cut glass catalogs which have been reprinted by the ACGA which members use in identifying their pieces. Some cut glass have acid stamp marks, usually, in the center of the bowl. They are difficult to see by an inexperienced eye. Barbara: You did a great job explaining our favorite American art form, American Brilliant Cut Glass! I, too, am an ACGA member, and thought I had read just about every book available on cut glass — but I learned a lot from your explanation. You’re right — there’s just not a lot of substantive cut glass available now. Most of what’s on the market today is either fake or pretty chewed up. One thing about which readers should be cautioned — make sure if you’re interested in a piece of cut glass on eBay or other auction sites that it is authentic American Brilliant Period Cut Glass. There are many unscrupulous sellers out there who will tell folks that something is cut glass when it really is not (believe me — in my early collecting days, I got burned badly). The one way to be sure you’re getting “the real thing” is to buy from ACGA member vendors. Please, ACGA vendors, identify yourself and your ACGA membership in your eBay listings so collectors will know who to trust! I inherited 5 pieces of American Brillant Cut Glass from my Grandmother, and would like to have them appraised. I live in Santa Maria, CA. Would you know anyone that would be qualified to appraise these pieces. I have a couple of the patterns that I have seen on these websites. My parents collected American Brillant Cut glass all of their lives. I just inherited their collection of about 100 pieces, most of them signed. I am interested in selling the collection and live in the San Francisco area of California. Do you know anyone I can contact. Hello, I just found 8 brilliant cut glass water goblets at the local thrift store for 2.00 each, (perfect). I’ve read all the books availiable to me at the local libraries but there are very few articles on drinking glasses. Any suggestions how to identify? I’d like to join the cut glass association. Any address for me? by Maurice Crofford) who brought accolades to the country with his great work. I have recently inherited several pieces of American Brilliant Cut Glass (some 30+ pieces). Do you know any collectors or appraisers in the Atlanta, Georgia area? If so, would you please contact me with that information. Thank you. I recently purchased a large signed Waterford compote 12″ diameter that is not only etch signed Waterford on the bottom but also signed by a person’s hand on the outside rim. How can I find a list of Waterford glass cutters that may have signed their work. This compote is early but the question is, how early. I’ve bought and sold cut glass for years but this is close to being the best piece I have ever found. Too bad we can’t leave pictures. Thank you, Steve. I started collection Anchor Hocking Wexford Clear Glass pattern. I have several pieces. After reading about lead in some glass wear. Would what I’m collecting be in this category? I plan on leaving the dishes to my grandaughter. to me that I may possibly have the complete set of a special order. There is a set of 12 – glasses and the bowls have the strawberry diamond or fans pattern. The hexagon stem has a knob in the center – with flat edges – and there are little knotches along the stems from bowl of the glass to the round stem which has 16 rays coming from the center. The acid marks on the base of each glass is the Hawkes trefoil form enclosing a hawk in each of the two bottom lobes, fleur-de-lis in the center, and the words GRAVIC GLASS printed over the top of the trefoil. The information on the American Brillant Period was very informative. I have several pieces of cut glass may possibly be depression glass. has the name Cristal d’Albret (made in France) I live in Media, Pa. I have seen some pieces of cut glass from Hawkes made by an artisan whose last name was Halter. Do you have any information on this man? The pieces are beautiful and I would like more information on this person. I can’t help yu on your question about Halter who you feel or know, worked at Hawkes, but I suggest you contact Kathy Emmerson at the ACGA (American Cut Glass Assoc.) office (Sec.) and ask her to refer you to whoever in the ACGA is a major student or researcher of Hawkes. Nobody knows more about the various members’ interests than she (a true fountain of helpful information). There are people who are constantly studying & doing research on the various glass companies & new information comes to light, periodically. New books & periodicals come out, especially published by LABAC. It is entirely possible, there are photographs of the various cutters who worked at Hawkes, in existence somewhere. If you have any personal or family knowledge of Halters, I am sure there is someone (a Hawkes fan and/or researcher) who would like to know – what you know. It isn’t unheard of for glass collectors to do family trees to help them hunt down family members of those who worked for the various companies, sicne they often have materials in their posession, like old catalogs or unique pieces of glass made at the company. Until contacted, they often have no idea that the information or examples of the glass – would be helpful. Thank you for sharing such great info. I am a collector of oriental rugs but occasionally buy other collectibles and antiques. I recently acquired the collection of a lifelong glass collector.The pieces are from the 1840’s on.There are many oil lamps,large and small. There are decanters,pitchers,plates,bowls,vases,spooners,pressed glass, milk glass,early heart patterns. I also acquired many books on glass collecting and every type of collectible glass is represented in this collection. I am interested in selling the collection because I don’t have the space to display it in my home and don’t just want to pack it away somewhere. I would appreciate any advice you may have. If you contact Kathy Emmerson at at the ACGA (American Cut Glass Assoc.) office. She can give you a name of someone in your area that could look at your glass. I am pleased you liked the information. Collectors Weekly is providing a great service to Collectors. Maybe you could edit the page name title An Interview With American Cut Glass Collector Barbara Meek | Collectors Weekly to something more catching for your content you create. I loved the blog post however. I wonder where I can find information about Libbey’s early patterns and bottom stamps. I have four bowls with the letter “L” on the bottom in caligraphy or script style, and numbers to the left of the L. Can anyone tell me when these were produced by Libbey, or where I can find that info? Thanks! I have inherited an assortment of cut glass pieces handed down from my family during the last few generations. Some of the pieces have some minor chips. How do I determine if the piece is worth repairing? And if repaired how much does it decrease in value? I live in New Hampshire and would like to repair these pieces as they are quite beautiful. What advice can you give me? We have inherited a 32 pc. set of Presidents done in yellow with gold rims still in box. Looking for info if you have any. I do not know much about CUT GLASS but I do feel it is really beautiful.